When you add up the challenges that humanity faces, the brunt of them falls on cities. Rising sea levels, flooding, earthquake/tsunamis, water supplies, transportation, power, jobs, governance—there's no safety in numbers; instead, with numbers come vulnerability. Speaking as a geologist, I naturally ascribe all this to life on a dynamic planet. Many experts have been urging cities to adopt resilience as a goal. Resilience is like robust good health in you or me, helping us avoid injury, cope with health threats, recover quickly and adapt to changes. Resilience is not defined by emergencies, it's what we do between crises to get ready for them. Resilience is the coursework for which catastrophes are the final exams. As the Rockefeller Foundation puts it, "Resilience is the capacity of individuals, communities and systems to survive, adapt, and grow in the face of stress and shocks, and even transform when conditions require it." When the Rockefeller Foundation turned 100 this year, the New York nonprofit decided to launch a $100 million project called 100 Resilient Cities. Applications opened in May, and the first 33 winning cities were announced on Tuesday. The geological hazards they face include earthquakes, tsunamis, rising sea level, landslides, drought, flood, erosion and more. These in turn threaten the cities' human and technological frameworks, on top of the intrinsic instabilities of growing population centers. A hundred million dollars across 100 cities gives each one a million dollars in support. In return, the cities "commit to developing or implementing a city-wide resilience plan" and hire a Chief Resilience Officer in the city government. Those two things should pretty much eat up the seed money. In addition, the cities will be offered "solutions to spur investments and financing for resilient infrastructure, information technology tools, and policy models for resilience-enabling laws and regulations." Finally, the cities must collaborate with each other, presumably via some online forum. Last month the foundation's president, Judith Rodin, told a New York audience what success might look like, naming five key jobs for the city's new mayor: (1) appoint a "Deputy Mayor for Economic Development and Resilience" to work resilience into every development, (2) get a bus rapid transit system working, (3) invest in new ideas and technology, (4) work the federal funding system more effectively and (5) start a municipal infrastructure bank to jump-start worthy projects. The threat to New York took shape this year as Hurricane Sandy, but those steps hold promise for our own regional threats. The 100 Resilient Cities website has brief descriptions of the 33 winning cities, in which the four Bay Area winners come off like a synergetic superhero squad. Alameda, uniquely vulnerable to tsunamis, is cast as the eager test case. Berkeley, "a pioneering city, research center, and innovation hub," has the brains. Oakland, "known for its ground-breaking community partnerships," has the people power. 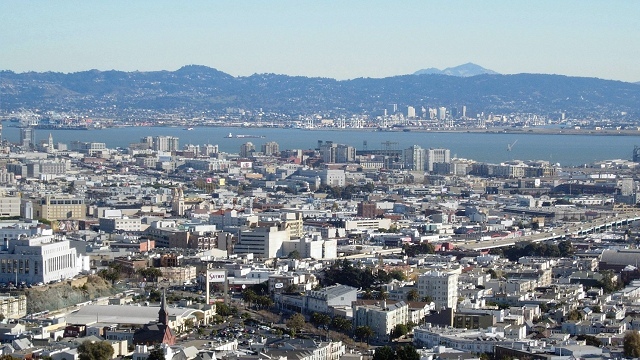 San Francisco, with "a history of devastating earthquakes and fires," is the can-do Big City. All of these things are true of all four cities: vulnerable to tsunamis, prone to quake and fire, laden with brains and means, and as self-active and innovative as any place in America. All four cities lie between two major fault lines, rely on water and power from distant sources, and have large non-English-speaking populations. Together, this squad of cities could form a tight gang that outfights its weight, or whatever superhero metaphor you prefer. The experiment may also be the key to adding resilience in places similar to the Bay Area, an urban area without a dominant city. This could fizzle or this could boom. A single city officer with a resilience plan is not much by itself, just a spark. Everything depends on the city, government and citizens alike, nurturing that initial spark into something sustainable—a culture of resilience. A key variable that the gang-of-four cities will test is whether being neighbors will make a difference. Their Chief Resilience Officers will be able to collaborate every day, in person if they like, and so will their governments and citizens. Will that be our superpower? Stay tuned.